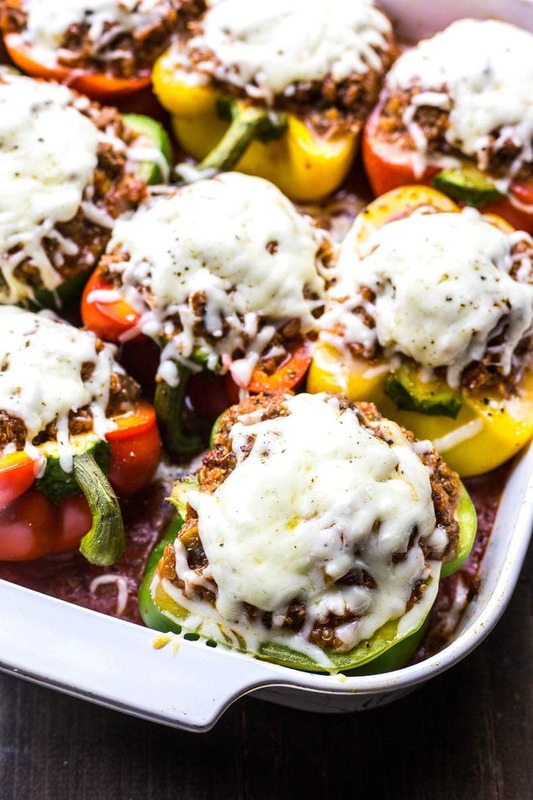 These Quinoa Lasagna Stuffed Peppers are a healthy, make-ahead dinner that is a fun spin on your favourite winter comfort food – enjoy these cheesy, saucy peppers all week! Long weekends don't last for nearly long enough.??? I mean, maybe it doesn't help that I insist on working for the whole entire holiday Monday, but I can't help that I have crazy deadlines. Like, I really don't think people understand that blogging is more than just food. I seriously wish it was just all about the food though. Take photos, eat, chill.? No emails, no social media scheduling, no spreadsheets, no analytics. There are days when I just feel so overloaded that I want to scream. You ever have one of those weeks? Where you just can't get out of the office early like everyone else seems to, or you can't just take off after a long, gruelling workday? Or you can't skip out on class? So this weekend, all of these revelations about my life and working too much finally came to a head. I think I actually hit my quarter life crisis – LOL yes, that is totally a thing. A millennial thing. 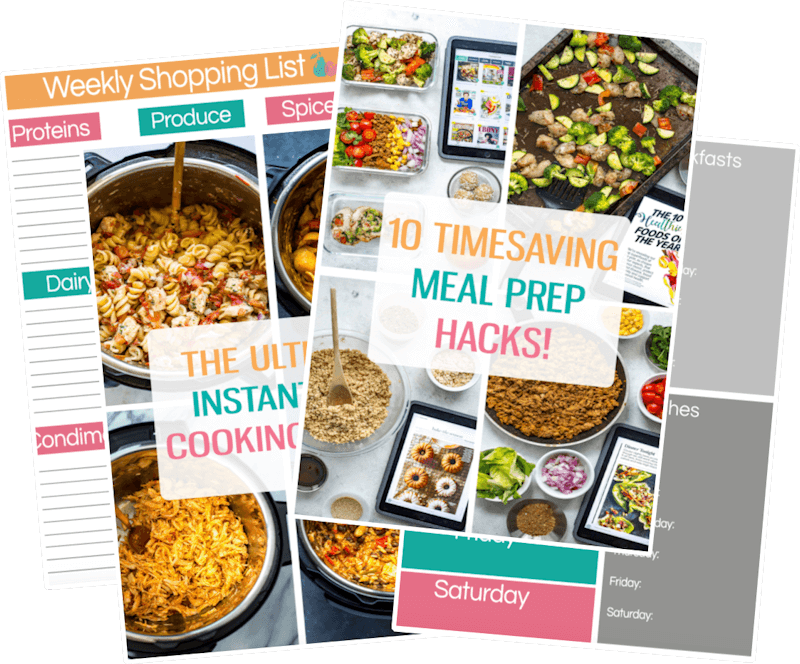 I have been working a ton of hours on the blog, from the photography and recipe development to the video editing, social media and technical aspects of the site. I am slowly starting to realize that even though I would like to, I really can't do it all. I honestly just can't work any harder. That I can admit. You should have seen me sitting upstairs on my bed on Sunday, frozen, feeling like I can't take on extra work, but also feeling frustrated with the process of being unable to be completely independent yet. I moved home to my parents about a year ago around this time. A WHOLE YEAR AGO.? Don't get me wrong, I have accomplished so much in a year. I have monetized my blog to the point where I'm making a liveable income, and I have a ton of great relationships with clients and people in my industry. I upgraded my camera equipment, I attended an industry conference, I graduated with my Master's degree and completed my thesis and my student loans will be paid off in a couple months. I'm also looking at launching a blogger course this year and thinking of writing a cookbook in the next couple of years. I have really done a lot in the year I've been working on this blog professionally. I'm sure you look back to where you were as a student or starting your career and realize how far you've come too. But I don't think it's easy to see growth in the day-to-day. Some days I get totally depressed wishing I had higher web traffic or could guarantee sponsored work. As a business owner, I experience so many daily high highs and low lows it's insane. Everyday is an emotional rollercoaster, and it can be hard to keep the bigger picture at hand. I'll get frustrated wishing I still lived in Toronto and hating that I have to sacrifice freedom and independence temporarily. I mean, I have the freedom to make more money now than I ever would at a desk job or other kind of work in my industry. I know that. But being a business owner definitely means that you have to sacrifice in other ways and sometimes that means working too much. Or moving home to grow it. Even last night, I had severe anxiety about what the work week would bring, all the emails to catch up on and the finer details of client work to iron out, as well as some social media scheduling to do, graphics to create, photoshoots to do. It gets overwhelming sometimes. And with cell phones and technology being what they are, it feels never-ending and like you don't have permission to turn off. But for a short moment through my nightly panic, I reminded myself that I really am doing what I love. I no longer have to clock in to an office, or write useless assignments. I'm in control, and I have time to figure out this crazy blogging career of mine. I reminded myself of the bigger picture, of the growth I have worked for and the things I actually enjoy about this job. The chance to be creative and work for myself. I think sometimes we forget that there will always be ways to make money. It's just important to try to live in the moment and be grateful for what we have and what we have worked for, and know that everyday won't necessarily be magical. But it won't always be a struggle either! Whatever goals you have in your life right now, just know that they will come with time and work. And the work is often the most rewarding part! So yes, I'm starting off your Tuesday back from a long weekend with a heavy subject I know. 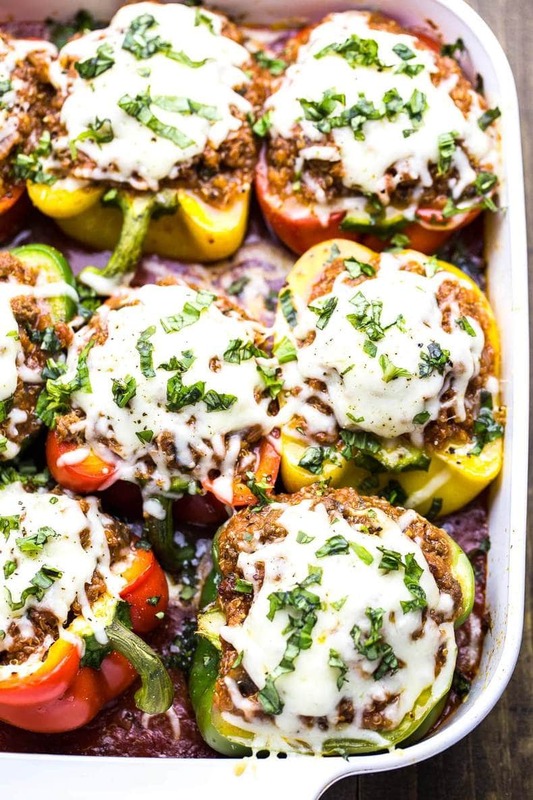 And these Quinoa Lasagna Stuffed Peppers probably look like they're equally as heavy. But they're relatively l0w-carb, and good for you. 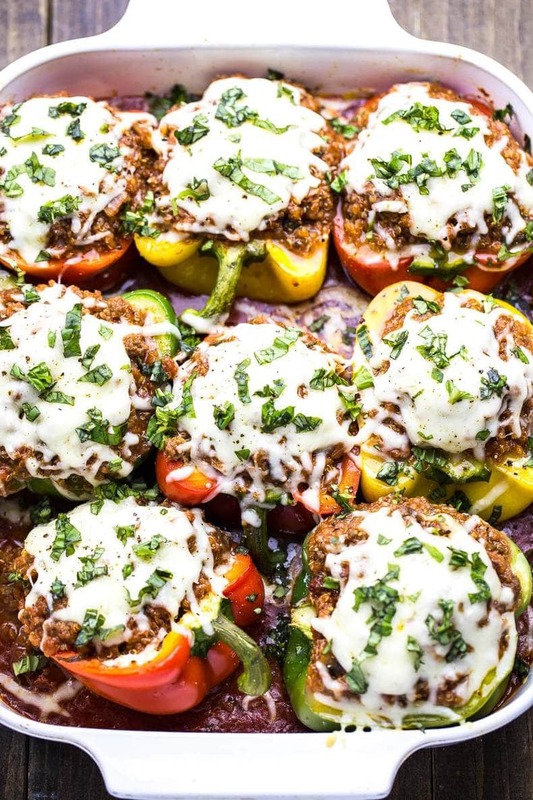 So basically, these Quinoa Lasagna Stuffed Peppers are everything you need after a long day on the job. 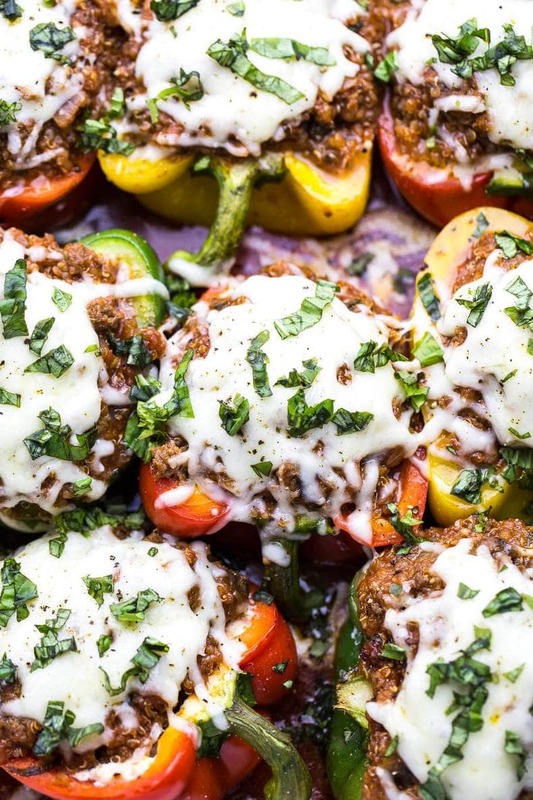 Ideally you will have anticipated the same weekday slump that I get and you will have made these ahead of time, but life doesn't always work out like you planned, right? The good thing here is you can do any number of the steps ahead of time. Feeling tired? Just cut open the peppers and make the stuffing later. Alternatively, make the stuffing ahead of time and either freeze it or refridgerate it up to three days. 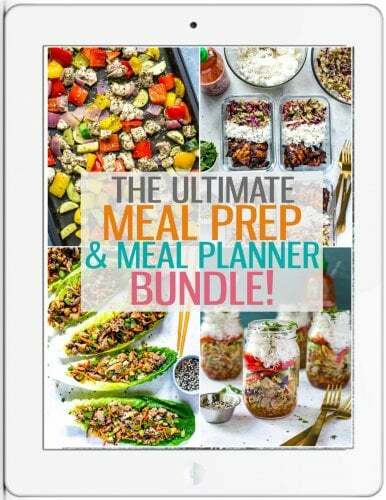 I'm not telling you what to do – I just want you to know this recipe is flexible.? And lasagna is here for you. In delicious, healthy pepper form. 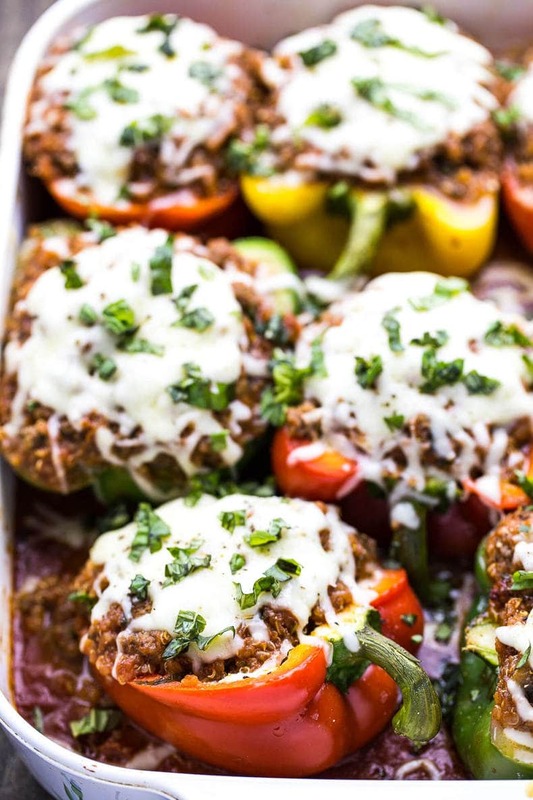 Will you be making these Quinoa Lasagna Stuffed Peppers? 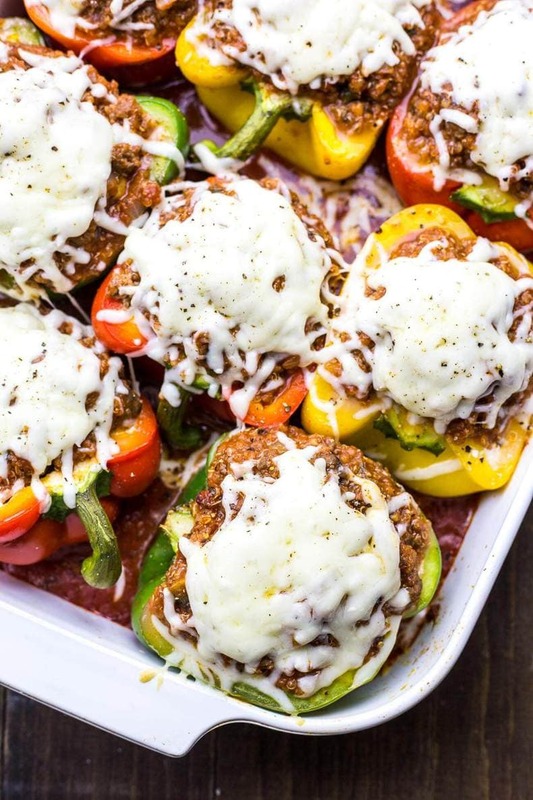 These Quinoa Lasagna Stuffed Peppers are a healthy, make-ahead dinner that is a fun spin on your favourite winter comfort food - enjoy these cheesy, saucy peppers all week! Preheat oven to 375 F. In a large frying pan, heat olive oil over med-high heat. Add onions and garlic, sauteeing for 30 seconds until fragrant. Add ground beef. Cook, breaking up with a spoon. Add mushrooms and cook another 2 min. Add both jars of passata to ground beef mixture, along with salt and pepper. Simmer for 15 minutes. Meanwhile cook quinoa according to package directions and prepare peppers by slicing length-wise in half and removing core/seeds. Drizzle with a tiny bit of olive oil and bake, covered in foil, in a large oven safe dish for 15 minutes. Add cooked quinoa to ground beef and tomato mixture, along with kale. Stir well and remove from heat. 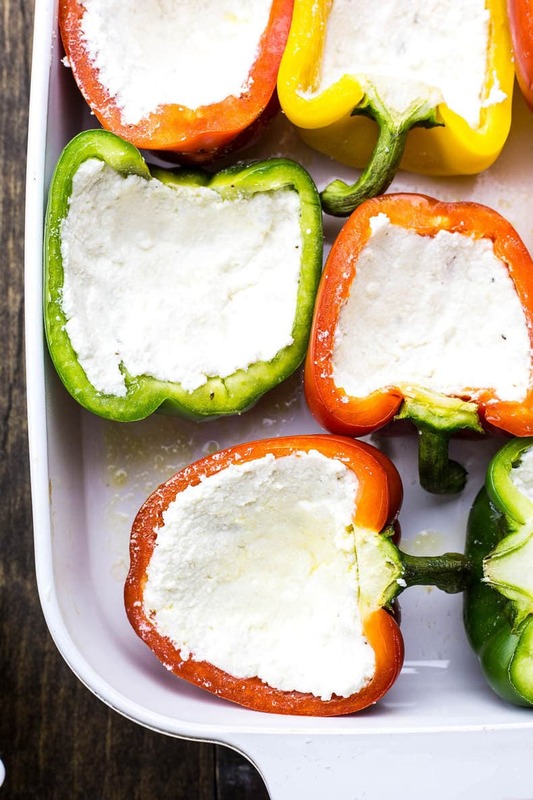 Remove peppers from the oven and when cool, add 2-3 tbsp of ricotta to each pepper, just enough to coat the bottom of each. This should use up the whole tub. 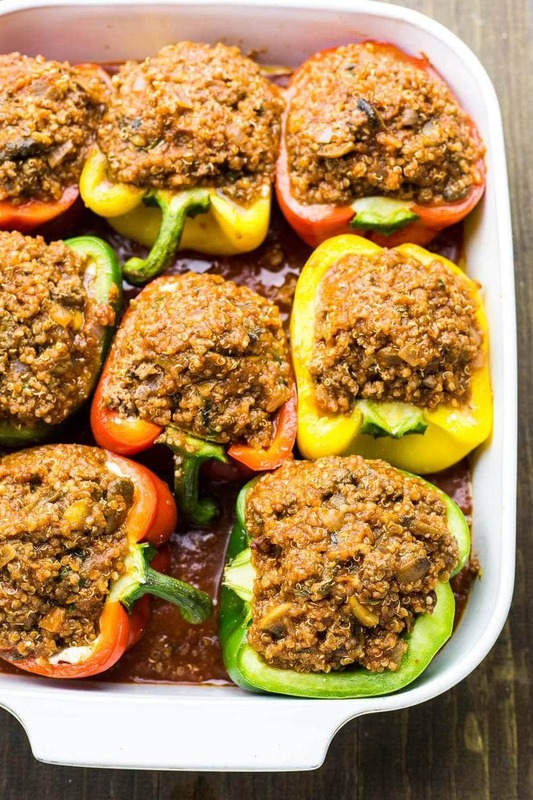 Add quinoa-ground beef mixture to each pepper - continue until mixture is used up. Peppers will be heaping full of stuffing. Bake, covered with foil, in oven for another 15 minutes. Remove from oven, top with grated mozzarella, and bake uncovered another 5 minutes or until cheese is melted. 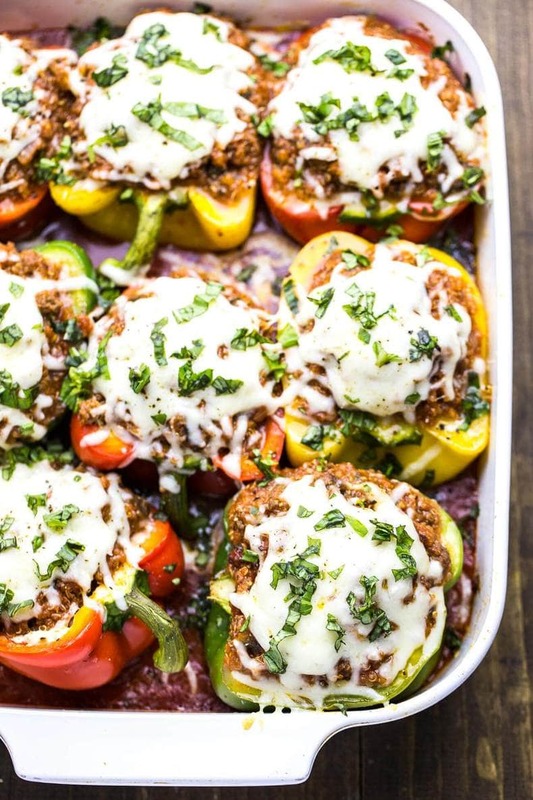 Remove from oven, sprinkled with fresh chopped basil and serve! « My Favourite Gourmet Soup Garnishes! Hello! This recipe looks delicious! I’m going to be trying it hopefully tomorrow! I just wanted to clarify that the recipe indeed calls for 8 bell peppers (so 16 halves). Thanks! Making them as we speak!